11/12 General Duty Series Casters Available at Casters of Amarillo, Inc.
11/12 general duty series casters have a main frame and raceway formed from a single piece of heavy-gauge steel. Their deeply corrugated design allows them to withstand stress and prevent distortion under a fully rated load. They are often used in applications from home garages to large industrial plants. Some of these applications include furniture dollies, service carts, bakery racks, parts bins, store displays, and laundry hampers in addition to many other all-purpose uses. 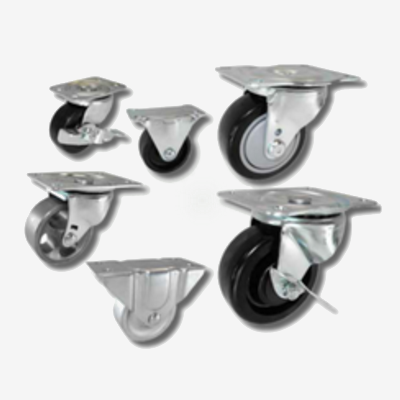 Widely used as a replacement caster for many applications, they range from 2" to 4" as rigid or swivel casters. A side brake is also an option as well as non-marking or semi-steel wheels. These rigid and swivel casters only come with a top plate, but the top plate sizes and bolt hole patterns match general industry specifications. The standard zinc plated finish is attractive and resists corrosion. The 11/12 General Duty Series casters provide a combination of mobility and durability while having the most economical prices.